When we began our research for the Darling Buds of May – Garden of England Trail, it started a pleasant journey down memory lane and into the heart of Kent. We spoke to locals in Pluckley who remembered the filming, unearthed location owners and extras and we even had the cheek to track down the location manager and cast to ask then to share their most memorable moments with us. Roger Holmes remembers the day he found out that his family home was going to be used as a filming location very well indeed: returning from America, he found ‘Home Farm’ overrun with crew members and cast as his parents had agreed to pay host to the series. Roger remembers the filming with much fondness and has many hours of behind the scenes footage. A signed photo of the cast has pride of place in his home. For groups of more than 25 looking to tour the home of the Larkins please contact Roger on darling.buds.farm@gmail.com. Buss Farm is also home to the annual Classic Car Show, which features all types of vintage cars. Perfick for a good day out. When visiting ‘Home Farm’, take the time to explore the OLDEST working computer in England. Weighing over 60 tons, the machine takes up most of one of the outhouses and is a far cry from the modern palm pads we have become so accustomed to. 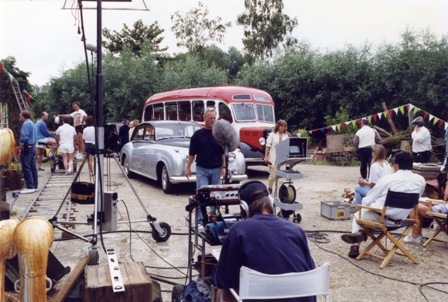 Jackie Grebby from Pluckley remembers being asked to move her car for a scene to be filmed and refused to move until the entire main cast signed a book for her. She has kept it to this day! On of the strangest sights she recalls from the filming days is watching the art department cover the village post office in mud to make it look old. At the height of the Darling Buds of May there could be up to six tourist coaches a day and “Ma’s Pantry” was set up in the village school to cater for the weary visitors. Anton Darby worked on all three series of the Darling Buds of May as Stage Manager and has many fond memories. When filming the series the cast and crew didn’t realise just how great and iconic it would become. It was a “wonderful filming experience” states Anton. Darby’s daughter even played an extra during the cricket scene; running about with the twins in the background. 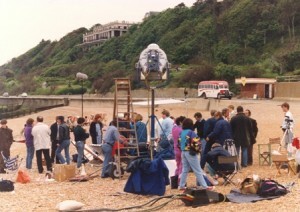 The cast and crew got on like a house on fire and many of them are still in contact and work together to this day. One of Anton’s most amusing memories was preparing the strawberry field. Unfortunately, filming schedules being what they are, the fruit was not ripe in time for filming, so all the strawberries needed to be shipped over from Holland’s greenhouses…”it was surreal planting them all.”Ma and Pop eating in the bath count as some of the most iconic scenes in the series. These were Anton’s creation! 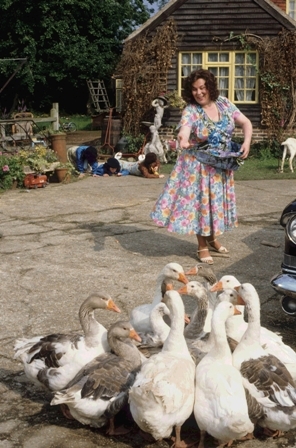 Pam Ferris, playing Ma, is a vegetarian which made life tricky for Anton, having to create a seamless plate of food being one half real meat and the other vegetarian. But this obviously did not keep Anton busy enough, since he found time to play a cameo: Mr Doors – husband to the Post Office owner. 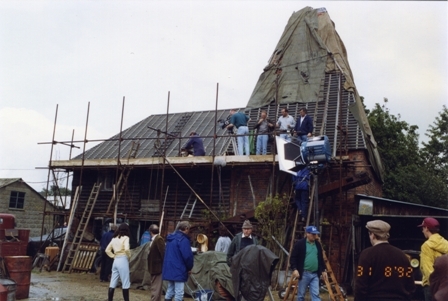 Menzies Kennedy – The Kent Location Manager claimed that working on the Darling Buds of May was the “Best job I’ve ever worked on.” It was Menzies who saw the potential of Pluckley Village: he picked up Richard Bates (Son of H.E Bates and Executive Producer) who only lived a couple of miles away and took him to see it. Richard saw what Menzies did: Pluckley was just the place. Richard Bates – Executive Producer and son of author H.E Bates recounts how his father got his inspiration for the stories: at a pit stop near Faversham! While H.E waited in the car as his wife picked up some sweets for the children of friends, a large, lively family walked out of the shop with crisps, sweets and ice cream and climbed into a blue truck: the Larkins were born! The Darling Buds of May was originally a short story, however, the publisher saw it’s potential and the short story became the first chapter of a novel. Published in 1957, H.E Bates went on to write the entire series of the Darling Buds of May. 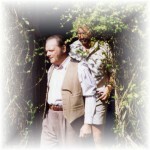 Richard’s most memorable experience while filming The Darling Buds of May was the casting of Mariette. They had seen over 300 girls and none of them had what they were looking for when the casting agent came to them and said “I’ve got one more girl for you to see”. Less than hopeful the team waited for the entrance of the final girl: Catherine Zeta Jones. As part of the 20th anniversary of the series, a new edition of the Darling Buds of May is being published in 2011. Bob Day was a Police Officer on patrol and one night when he was driving around St.Michael’s (near Swane Road and Harbon Lane), he came across a large van blocking the road. It was to act as David Jason’s changing room and they were trying to maneuver it into a field. Sarah Knight, Landlady of the Black Horse Pub in Pluckley, has many fond memories of the filming taking place. She remembers when the team came into her class at Pluckley school looking for extras to be choir boys for Marriette and Charley’s wedding. In fact, she has so many fond memories of the filming, that when she took over the Black Horse pub she decided to slowly restore it to just as it was during the series. With old press clippings and photos on hand, she is truly worth chatting to when next you pop in.